The dates of Liberty Con have changed. The Con will now be held June 28-30. 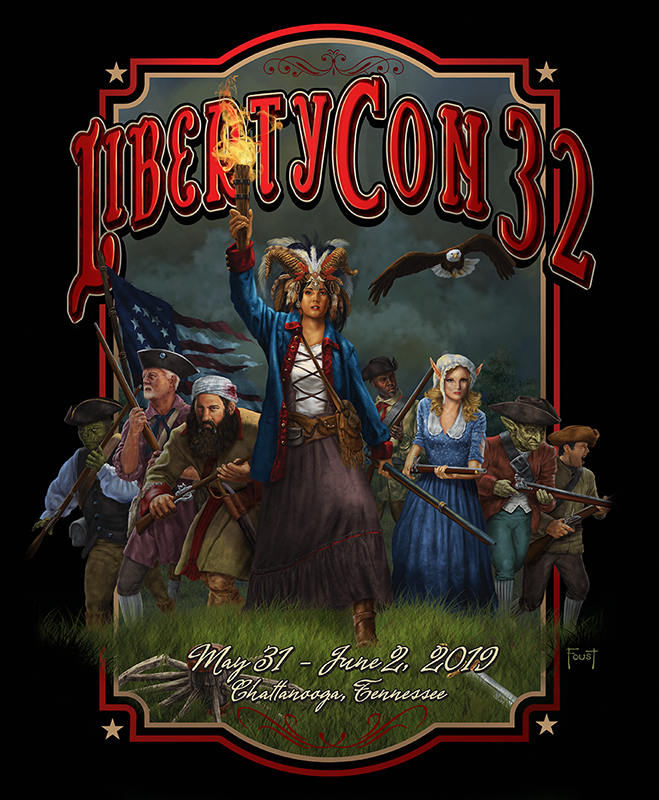 1-16-19 I am going to be the Artist Guest of Honor at LibertyCon this year. The con is in Chattanooga, TN on May 31-June 2. LibertyCon is a small con. They cap attendance at around 700. It sold out in a matter of hours this year. I created a new piece of artwork for the con. I really had fun with it. The theme was a fantasy piece loosely based off the Statue of Liberty. I’m looking forward to the con! 11-17-18 Memphis Comic and Fantasy Con was at Graceland again this year. There were a lot of logistical problems this time around. Traffic was down from previous years. All in all, I had a good show. I had a couple of good patrons come in from out of town and that helped. I got to hang out with Dean Zachary, Roland Mann, Jeff Whiting, and Big John Martin. It was a small show this year, but I got to hang out with some good people. 10-16-18 Just got back from Archon in Collinsville, IL, near St. Louis. I really enjoy this con. It is in a small convention center surrounded by hotels and restaurants. It’s perfect size for a 3000+ convention. This year, I had my biggest set up yet. Two 8’ tables, plus pro panels. I had my best Archon ever with the set up. Totally worth it. I set up at Archon once every two or three years. It’s a market that can be saturated with my work if I show up every year. It’s a great literary Scifi con. The have a good art show also. Highly recommended to artists first starting out. 4-2-18 It's been a while since I updated the site. Several things are on the horizon. I have the 2018 Yearbook Kickstarter that will be launching soon. I will be in the art show at GenCon for the first time this year, and the Patreon site is rockin' along. With all of the changes in Facebook and social media, I've been reevaluating my marketing strategies, or more specifically, the lack of them. I will be regularly updating this site, as well as my Deviantart page and Infected by Art page. I am also looking to create a quarterly newsletter, I just have to decide what form it takes. I've updated the site with a ton of new artwork, made a new blog post, and have started refreshing the site. I even created a new logo header. I'm planning for entire overhaul of the store. Just like I did with the Patreon page, I've got to get used to regular updates. I have several things planned, so keep an eye out. 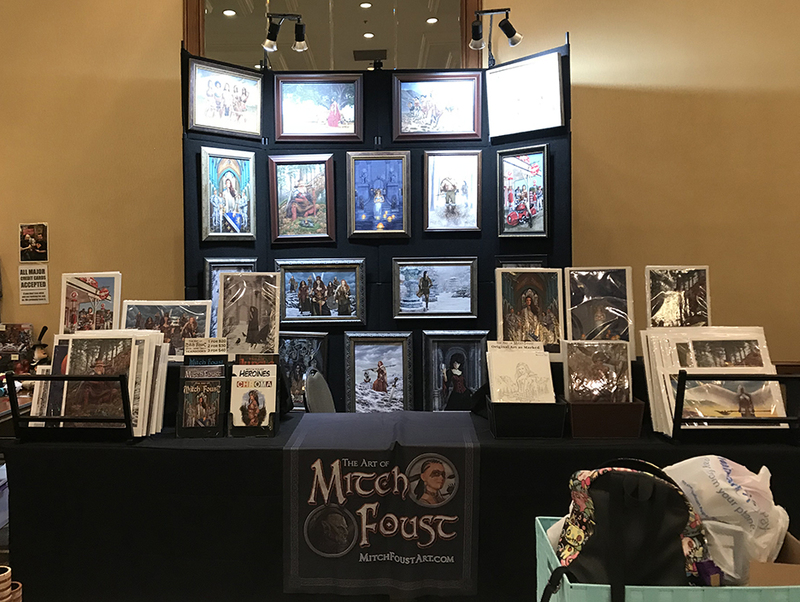 Here is my table at MidSouthCon a few weeks ago. I've made a few changes to the setup and they seem to have worked! 2-1-17 My Patreon page has launched! This is a great way to observe my creative process. By becoming a Patron, you will have access to exclusive art, monthly coloring challenges, step by step process, works in progress, tutorials, and even a chance for some original art! If you've enjoyed my work, please consider becoming a Patron! 10-9-16 I will be a guest on the One Fantastic Week podcast this Tuesday. Sam Flegal and Peter Mohrbacher have created a great show dedicated to artists that want to make a living with their art. The podcast will air Tuesday, October 11, at 11:00am Central. 10-5-16 I attended Archon last weekend. It was a good get away for my wife and me. The St. Louis area has some great fans. I sold a lot of art to some old friends. The new work was very well received. Archon is a great convention with a great facility. It is perfect for young artists looking to get into setting up at cons. Great artist alley and terrific art show. 9-9-16 Back from Dragoncon. I had a really good show. I got to see a lot of old friends and make some new ones. There was a lot of talent in the expanded art show. I did manage to two awards for the same piece. Andraste won Best Warrior and Best Amazon. 5-14-16 I have been invited to Hypericon as their Artist Guest of Honor. Hypericon will be June 17-19 in Nashville, TN. It has been several years since I was at a show in Nashville and I'm looking forward to returning. Hypericon seems to be a great little convention with a lot of great local talent. I will have several new images for the show. 2.26.16 I will be the Artist Guest of Honor at CoastCon this year. CoastCon is one of the longest running cons on the Gulf Coast. I've heard many good things about the con and I'm honored to be their Artist GOH. I painted the cover of their program guide, featuring their mascot, Herbie. Herbie is a crab shaped spaceship. It certainly is a bit different. If you are in the area March 4-6, stop by. They have a great facility and I'm sure it will be a lot of fun! 2.4.16 I got a message from Jay Schryer containing a link to a story he wrote about one of my paintings. The painting was Reader of Bones. I was a bit astonished that someone would think enough of the image to write a story about it. I read the story and enjoyed it very much. Jay's website exterminis.com Stop by and take a look around. Thank you Jay! 12.30.15 New Site is up! It's been several years since I had a web site. I've been using my Deviantart site as my web presence. I really love the Deviantart community, but I wanted a site with a store and a blog. I'm still learning how to set the site up, but it's a start.